Rick Conger was one of the more remarkable prep and collegiate pitchers in Los Angeles history, advancing rapidly to the major leagues for an all-too-short professional career during the World War II era. Conger was lights out during his days on the mound for Fremont High School, widely recognized as the top professional prospect during his senior campaign in leading Fremont to the City Championship in 1938. Even at a baseball factory like Fremont, Conger made waves as a sophomore, winning 17 consecutive games en route to a City title. 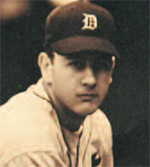 The right-hander continued his triumphant ways at UCLA, losing just one game as a freshman before signing with Detroit in 1940. The Tigers sent him straight to the majors, and Conger didn’t disappoint. The 19-year-old struck out one batter during a scoreless 8th inning, then picked up the win as the Tigers rallied in the final frame. He would pitch one more game that season for Detroit before being demoted to the minors. Over Conger’s major league career, he would go on to toss four scoreless innings for the 1941 Pirates, and post a 2.16 ERA in two games for Pittsburgh in 1942. Conger would throw 13 games for Philadelphia in 1943 in his final and longest stint in the majors, winning two memorable games along the way. On July 17, Conger hurled a complete-game two-hitter against the New York Giants, holding Hall of Famers Mel Ott and Ducky Medwick hitless in a combined six at-bats. And on August 12, Conger would win his final professional game with seven innings of two-run ball against Pittsburgh. Wrapped in and around Conger’s professional stops was a decade-long minor league career that included play with the PCL-winning 1944 Angels, where he posted a 13-7 record with a 2.88 ERA before entering the military to serve in World War II later that year. Conger also pitched in the minors for Sacramento, Beaumont, Albany, Portland and Toronto. Conger passed away in 1970 at the age of 49.